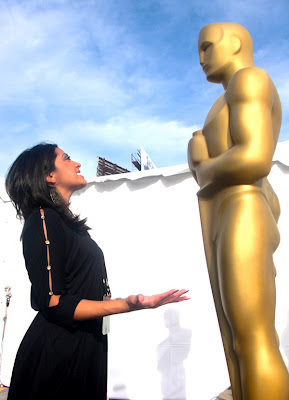 Megan Telles writes about her love for the Academy Awards. This is the ninth column in a weekly series, counting down to Oscar Sunday on Feb. 26, 2012. Hello to all my Oscar junkies … it's the most wonderful time of the year! When I was a sophomore in college (2009), I was part of the first ever mtvU and The Academy of Motion Picture Arts & Sciences, "College Correspondent Competition." It was and still is a national competition that searches for teams from colleges around the nation that want to compete for a spot on Oscar’s Red Carpet. At the time, Andrew Huse (videographer) and I were attending San Diego State University. We both worked for the school newspaper, The Daily Aztec. I wrote for the entertainment beat and Andrew was a photographer. We heard about the opportunity to submit a short video to mtvU and the Academy the night before it was due. Long story short: we shot, edited and submitted the video in less than 24 hours! We told each other, “Well that was fun, but we won't ever make it to the next round.” Then our lives changed a few days later when we got the phone call from MTV; we had made it into Top 10 in the national competition! After a couple of weeks of online voting, we received the big phone call: We were going to Hollywood! Next thing we knew, it was Thursday morning. With our bags full of dreams, we were headed north on the I-5 freeway, en route to the Kodak Theatre. Upon arrival, we were each given keys to our own room at the Renaissance Hotel in Hollywood, along with spending money and networking opportunities GALORE. It was love at first site! That was the day Andrew and I left San Diego and arrived in Hollywood. We were escorted onto the Red Carpet three days before the Oscars showdown. Hollywood Boulevard was shut down, the oversized, golden statuettes stood proud and tall, I felt the energy of the Academy and I witnessed hundreds of media outlets cover the pre-Oscar frenzy. The chaos and the hype all around me felt like home. I have always had a passion for reporting and hosting since I was a little girl. So the glitz and glam, Los Angeles and the cameras on the carpet that day lit me up. I knew from that very moment that I was obsessed with the Oscars. It's hard to think back to any memory preceding my first time on the Red Carpet. I remember what I was wearing, the blood orange tank top and my favorite pair of jeans. I remember having an out-of-body experience and telling myself to absorb every moment on the journey! It was a surreal moment that I will hold onto forever. 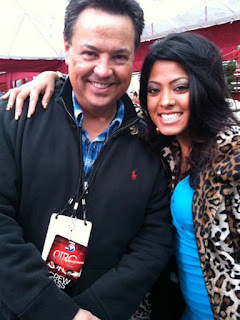 On a personal note, I would have to say when I met George Pennacchio on the Red Carpet. He was and still is the entertainment anchor/reporter for ABC7 in Los Angeles. I grew up watching him and the ABC team every night on the news. Knowing my career goals, I hunted him down on the carpet that Friday. I walked right up to him in a determined manner, stopped him (politely), handed him a business card and said with a big ol' eager smile, "Hi George, my name is Megan Telles and I'm an aspiring journalist. I'd love to be your intern this summer." He smiled, asked me what I was doing on the carpet, learned about the competition and he handed me one of his business cards. He said to contact him after the Oscars. I did. That following summer I was his intern … which lead me to be the first intern for ABC's newly syndicated entertainment program, “On The Red Carpet” (OTRC). Through those experiences, I was picked up by various news outlets to cover the 82nd and 83rd Academy Awards. My early career has continued to snowball since! When I get to ask celebrities questions that really make them think back to their roots, there is something really powerful that happens. I become very emotional hearing the journeys that these people embark on in order to “make it” in the TV/Film industry. It's compelling to learn first hand how many doors were shut in these actors’ faces, how many discouraging moments they battled through before they ever starred in their first film or produced their first Oscar-nominated picture. When the Oscar winners take the podium to give their acceptance speeches, I melt. This is hands down my favorite aspect of the Academy Awards. It’s a dream-come-true moment for each winner. And to be a part of their “victory moment” is extremely fascinating. No way! To grasp the attention of millions of viewers, and to be liked … is challenging enough. They don't need any advice from me. If they are given the chance to produce/host the Oscars, they must be doing something right! Best Actor/Actress in a Breakout Performance. A “breakout” performance can only happen once in an actor or actress' career — which makes it so special. So, why not dedicate an entire category to recognizing the best breakout of the year? Plus, this new category would generate more great acceptance speeches … and that’s exactly what I love about the Oscars! Watching the competition grow each year impresses me most. Now that ABC7's OTRC has partnered up with the Academy. This is a sign that the perfect people are involved. After interning with Pennacchio and OTRC, I know how hard the ABC7 team works and how engaged they are in students’ careers. The tools that these college journalists will take away from working the carpet with Pennacchio, Chris Balish (OTRC co-host) and Rachel Smith (OTRC co-host), as their mentors, is invaluable. From this point forward the competition will only get bigger and better. And that’s what I am looking forward to — simply because I know how important the competition is to one’s future in the entertainment industry. Megan Telles, a recent graduate from USC Annenberg School for Communication and Journalism, was a finalist in the Academy and mtvU's Oscar Correspondent Contest in 2009. She has since reported on the Oscars from the Red Carpet for various media outlets, including The San Diego Union-Tribune. Follow her on Twitter @mtelles or visit her website at www.MeganTelles.com.